BEA released the advanced estimate for GDP growth in the third quarter, 1.5%, well below the 3.9% growth of the second quarter. 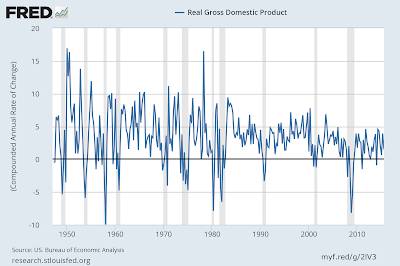 One can see that the recent recovery is slow even when compared to the Clinton and Bush II recoveries. So, nothing new, the slow recovery continues. If the budget deal gives some hope that at least we're not going to shutdown the government, and as a result avoid an even worse slowdown, there is very little reason to hope for the kind of fiscal stimulus we need. Lecture at the Renner Insitute in Vienna, October 6. It has become commonplace to raise the analogy between the recent experience of the dynamics of income distribution and growth, and that of the era before the Great Depression. However, no study of the demand regime has been done for the early twentieth century period; this study attempts to fill that gap in the literature. Based on a Kaldorian model, I estimate whether the demand regime of the pre-Great Depression era for private domestic output was wage-led or debt-led. The results of the study show the demand regime was wage-led with a considerable role of private debt in driving aggregate demand. Furthermore, I discuss the Roaring Twenties period and argue that increased income inequality led to the rise of destabilizing channels that propped up demand which contributed to increasing economic fragility on the way to the Great Depression. GDAE will award its 2016 Leontief Prize for Advancing the Frontiers of Economic Thought to Diane Elson and Amit Bhaduri. This year's award, titled "Development and Equity," recognizes the contributions that these researchers have made to economic understandings of development, power, gender, and human rights. I often say that causality is the main, but not the only, difference between mainstream and heterodox approaches in macroeconomics. It's true for differences between Say's Law versus the Principle of Effective Demand, for discussions of exogenous/endogenous money, and also for interpretations of the relation between growth and productivity. So low productivity growth causes low output and employment growth, rather than vice versa. Further, lower investment is what causes low labor productivity, which is actually a plausible mechanism. No new machines, no increase in labor productivity. But as the IMF has recently noticed, the accelerator is the mechanism that explains investment behavior (see here on the previous WEO rediscovery of the accelerator, and also Obstfeld says in the following line: "low aggregate demand... discourages investment"), and that implies that growth is what determines investment and, as a result, labor productivity. 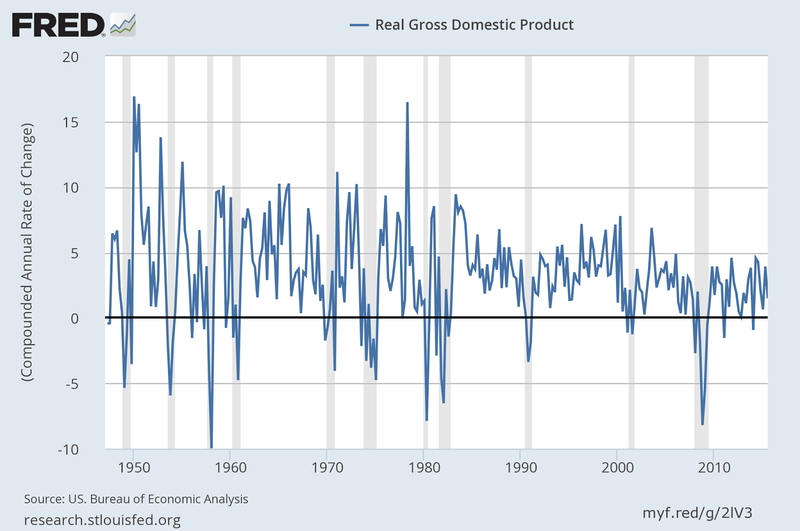 So low growth is caused by low growth. Good job! * I'll leave out the problems with total factor productivity, which have been extensively discussed in the blog before. New paper with Esteban Pérez published by the Levy Economics Institute. The Spanish crisis is generally portrayed as resulting from excessive spending by households, associated with a housing bubble and/or excessive welfare spending beyond the economic possibilities of the country. We put forward a different hypothesis. We argue that the Spanish crisis resulted, in the main, from a widening deficit position in the nonfinancial corporate sector—the most important explanatory factor behind the country’s rising external imbalance— and a declining trend in profitability under a regime of financial liberalization and loose and unregulated lending practices. This paper argues that the central cause of the crisis is related to the nonfinancial corporate sector’s increasingly fragile financial position, which originated from the financial convergence that followed adoption of the euro. three lectures in the Phd programme in Economics of Roma Tre University. For those not in Rome, the papers on which the lectures are based are available here. Double posting on the Credit Suisse Global Wealth Report (2015) (other post here). I had discussed the previous issue here. Below the Global Wealth Pyramid. Not much difference with previous one, but a bit worse. Now 71% of the population holds 3% of the wealth (before it was the 67% at the bottom held 3.3% approximately). And the top 0.7% of the population holds slightly more than 45% of total wealth. 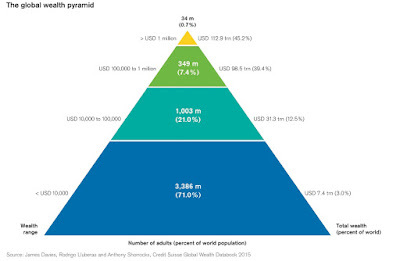 We estimate that there are 123,800 UHNW individuals worldwide, defined as those whose net worth exceeds USD 50 million. Of these, 44,900 are worth at least USD 100 million and 4,500 have assets above USD 500 million. UHNW means Ultra-High Net Worth (or what a decade ago Citigroup analysts called the plutonomy). So about 4,500 with a net worth above 500 million dollars. For his work on "consumption, poverty and welfare" according to the press release. It wasn't Atkinson, for inequality, as I suggested it was possible, but given the other possibilities cited this is quite good. Deaton had received last year the Leontief prize, which usually goes to heterodox economists (the other Nobel to win the Leontief was Sen), together with Jamie Galbraith. “One key to African growth is what happens to commodity prices. Many African countries have long been and are still dependent on exports of 'primary' commodities, mostly unprocessed minerals or agricultural crops. Botswana exports diamonds; South Africa, gold and diamonds; Nigeria and Angola, oil; Niger, uranium; Kenya, coffee; Côte d’Ivoire and Ghana, cocoa; Senegal, groundnuts; and so on. The world prices of primary commodities are notoriously volatile, with huge price increases in response to crop failures or increases in world demand and equally dramatic price collapses, none of which are easily predictable." The preoccupation with commodity price volatility has a long history in economic development, but probably Raúl Prebisch and the economists at the Economic Commission for Latin America and the Caribbean (ECLAC) have been the pioneers and the most persistent in emphasizing its relevance. That tradition, of course, emphasizes demand as the engine of growth, and the balance of payments as its main constraint in peripheral countries. A sharp slowdown in the Brazilian economy presents a critical challenge for the Workers’ Party (PT) government led by Dilma Rousseff. Between 2011 and 2014, economic growth averaged only 2.1 percent annually, compared with 4.4 percent in the 2004-2010 period. The recent downturn can be squarely blamed on economic policies implemented by Rousseff’s first administration (2010-14). This policy change sought to reduce the state’s role of directly promoting the expansion of aggregate demand through fiscal stimulus and promoting supply side structural change through public investment, a strategy that had been done quite successfully until 2010. Meanwhile, inclusionary social policies concerned with decreasing inequality remained in place. The Trans Pacific Trade charade -- Joseph Stiglitz and Adam Hersh on TPP too (I posted quite a bit the week on this). I should note that even if TPP was only about free trade in goods in services it might not be good either. Why choose this course? Steve Keen and some students explain why learning economics with critical perspective is the way to go. Kingston in that sense is not that different from Bucknell. So, a bit busy this week, but as promised here is a more specific, if short, discussion of the Trans Pacific Partnership. The agreement was reached this week, and now approval must be obtained in Congress, and my guess is that there is a decent chance that it will pass with bi-partisan support (after all fast track was approved and that is why the Obama administration could reach an agreement). My guess is that several people that seem less than supportive right now, will come around, like, for example, Orrin Hatch in the Republican camp, who has said he has reservations, or Hillary Clinton, whose PBS interview has been seen as a reversal of her pro-free trade views. She actually does not say she is against, and only says after being prompted a second time that she is not in favor of TPP as it currently stands. She adds that she thinks the agreement might not live to her high standards, but she is very clearly for free trade agreements, the ones that bring high wages and more jobs to the US. Also known as unicorns. The fact is that on FTAs the establishment in both parties is basically in favor, as much as mainstream economists. So, as I noted before (in my discussion of the Colombia FTA), FTAs are often not about 'free' movement of goods and services, but are also ways of protecting corporate interests. That's why what you should expect is not that one country wins and another looses with a trade agreement. Corporations and elites win, and workers (consumers) tend to be on the loosing end (that would be a better description of the effects of NAFTA, for example). The two big issues being discussed are the protections for pharmaceutical patents, and the so-called currency manipulation, given the recent media comments. Note that the first issue is one of the main sticking points of the so far failed Doha Round of the World Trade Organization (WTO) negotiations, which include not only property rights, but also government procurement policies, and investment rules. All of these issues tend to limit the ability of developing countries to pursue the policies that promoted development in advanced economies. 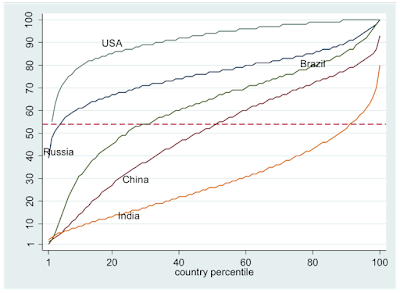 Basically FTAs reduce the policy space of developing countries, and the ability of governments in advanced economies to protect workers and consumers.In this specific case, TPP seems to extend the patent protection for pharmaceuticals, reducing the ability of governments to produce generic medications, with potentially large effects on public health. On the second issue, the currency manipulation, which has been always tied to China (not in TPP, btw), which suggest that depreciation leads to a significant cost advantage, and that it should be banned. 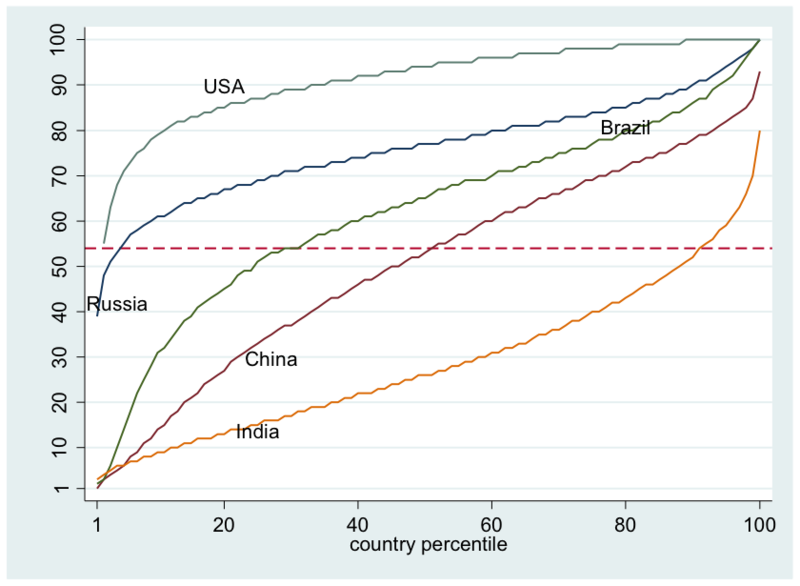 Here I'm not only skeptical about the supposedly fantastic price substitution effects of a devalued currency, but more importantly, as I have pointed out before, most developing countries in Asia (and certainly China) have had large increases in real wages, which means that their currencies have often appreciated in real terms. Besides, I can't see how a trade agreement would legislate on exchange rate policy. Prize will be awarded soon (next Monday). Thomson-Reuters prediction, based on citations, below. Full list of forecasts here. Other people high on the speculation list are Orley Ashenfelter, Robert Barro, David Card, Peter C. B. Phillips and Paul Romer. I've read someone suggesting Anthony Atkinson, for his work on inequality, since Piketty is a no-no. PS: Given that the econ 'Nobel' is not a real one, and that we give it to people that say opposite things (e.g. Myrdal and Hayek, Fama and Shiller), there should be a shadow Nobel, with a contrarian for each one given out. The final agreement on the Trans Pacific Partnership was reached yesterday. Now it must be approved in Congress. I had noticed before (here, here and here) the bi-partisan support for TPP (not all bipartisanship is good after all) and the limitations of the agreement itself. Will write something later this week on the specifics revealed by the agreement (no big surprise, btw). You can also read my paper "What do undergrads really need to know about trade and finance." It was a response to Krugman's "What do undergrads need to know about trade." He used to say comparative advantage and specie-flow mechanism (which means the balance of payments is self-adjusting; so his argument is about trade and finance really). I suggest that absolute advantage and unstable capital flows might matter too. Krugman seems to have wised up on this, and is not for TPP (even if his reasons are weird; if I have time I'll discuss that too). Labor market still weak. New BLS report says that: "total nonfarm payroll employment increased by 142,000 in September, and the unemployment rate was unchanged at 5.1 percent." Also: "average hourly earnings of private-sector production and nonsupervisory employees were unchanged" and revisions meant that "employment gains in July and August combined were 59,000 less than previously reported." Not enough job creation, labor participation falling, and wages stagnant. Secretary of Labor said, correctly, that an infrastructure bill would be needed to get us out of the slow recovery. That used to be a bipartisan policy. Nobody was against fixing roads and bridges. But the chances for expansionary fiscal policy are nil. The US has adopted, basically since 2011, a contractionary stance. This basically results from the politics of hostage taking in Congress, and while we narrowly avoided a government shutdown this week, it is very likely that the budget and the debt ceiling limit would lead to one before the end of the year. Class warfare, and attack on labor, is at the end of the day the basis for this irrational fiscal policy, as I discussed a couple years back after another shutdown was in the news. PS: I'll be discussing some of these issues later today (4pm Eastern time) at the Rick Smith Show. In this short note I will not add anything of substantial to the debate with Marc Lavoie on the nature of the Eurozone (EZ) crisis in view of Target 2 (T2). Readers have numerous papers to look at (including Lavoie 2015a/b, Cesaratto 2013, 2015a/b) and posts (Vernengo 2015, Ramanan, 2015). However, although most of relevance has already been said, there is perhaps still some space for few qualifications. 1. Subject of the dispute is on whether the EZ crisis can be considered a balance of payment (BoP) crisis in view of the existence of T2 and of the Eurosystem semi-authomatic refinancing mechanism, or if it should be considered a crisis derived from flawed institutional mechanisms that led, in particular, to a belated intervention by the ECB to sustain peripheral sovereign debts. So the difference is that I see policy limits (perhaps political was not the right word) to T2 imbalances in the sense that policy makers cannot see them growing indefinitely, reflecting growing flow and stock foreign indebtedness and, correspondingly, mounting indebtedness of peripheral private and sovereign debts. 2. To give an example, would a central government with a sovereign central bank (CB) let one region (say Calabria) to expand its expenditure issuing regional bonds by letting its CB to guarantee an unlimited issuance? Notably this behaviour would let this region to accumulate an unlimited balance of payment deficit and foreign debt with the rest of the country and the rest of the world. At the minimum the other regions would like to imitate this (electorally) convenient behaviour. The reader can derive by herself the economic consequences of this behaviour. If this does not complicate the life of readers, a reference to a view that cannot be suspected of fiscal timidity, that is to MMT, is useful here. Wray and Nersisyan (2010: 16) argue that although there are not “financial constraints [to sovereign debt and deficit] inherent in the fiat system”, nonetheless some arbitrary fiscal constraint, e.g. a balanced budget of the cycle, is necessary to avoid that the government “might spend ‘out of control,’ taking too large a percent of the nation’s resources”. Would any national government let its CB to back a single region to behave this way? And should we expect the EU sustaining a single member, let alone a group of members, to behave this way? Or could we expect the U.S. printing dollars to check the Argentinian foreign debt crisis in 2001? It can be noted that Matias eventually endorses the argument (that I refrain to attribute to Lavoie but that, perhaps, he might approve) that the absence of an unlimited credit by the ECB is the ultimate cause of the BoP crisis. My view is that it is unthinkable to believe in an open ended support by the ECB (or by the EU governance) of unlimited Target 2 imbalances. And this is, in my view, the ultimate cause of the imposition of austerity policies on the periphery. The ECB “whatever it takes” (threatened) intervention, finalised to alleviate the austerity costs by reassuring financial markets, was indeed subordinate to the adoption of austerity measures - so that no German court could protest, inspired by Werner Sinn, that the ECB was sustaining unlimited peripheral foreign debts. The next are minor points. by ”general appreciation” I meant “positive reception” (see e.g. the Microsoft Window Word dictionary), but perhaps the way I expressed myself was ambiguous.